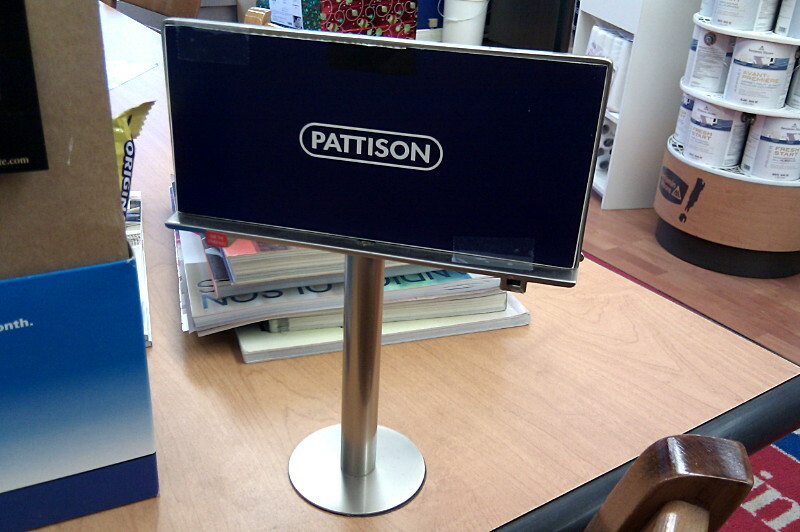 I can’t imagine giving someone a worse Christmas present than a replica billboard complete with ad company branding. 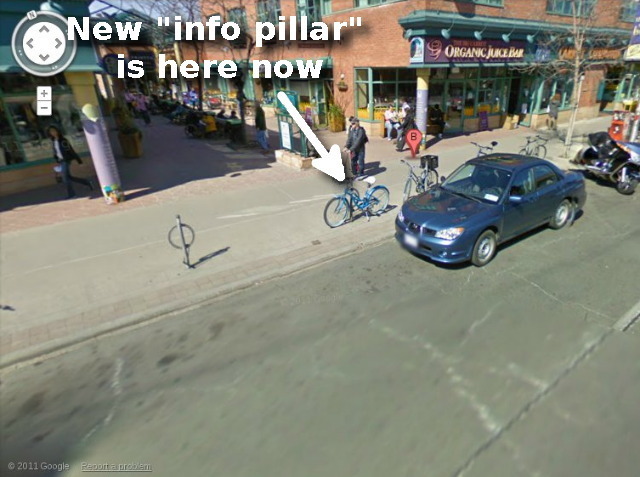 I’ve written to my councillor to ask why parking for two bikes was removed so that Astral could place two giant ads on the sidewalk. It’s almost impossible to find bike parking in this area during the summer and only marginally easier during the spring and fall. We need many more racks here, not fewer. 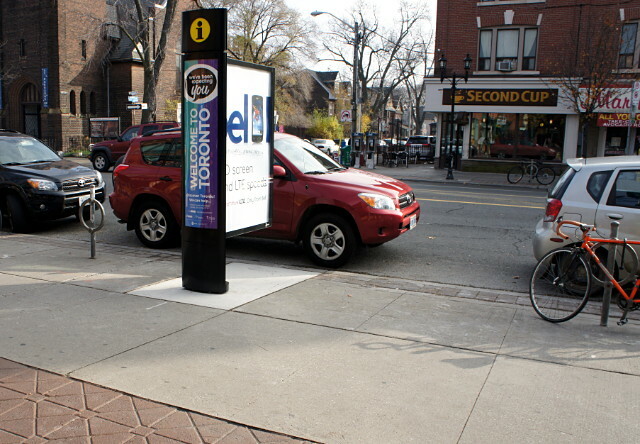 I don’t think that drivers or merchants would quietly stand by if they lost two car parking spots to a billboard, and I don’t see why cyclists should be expected to do so either. 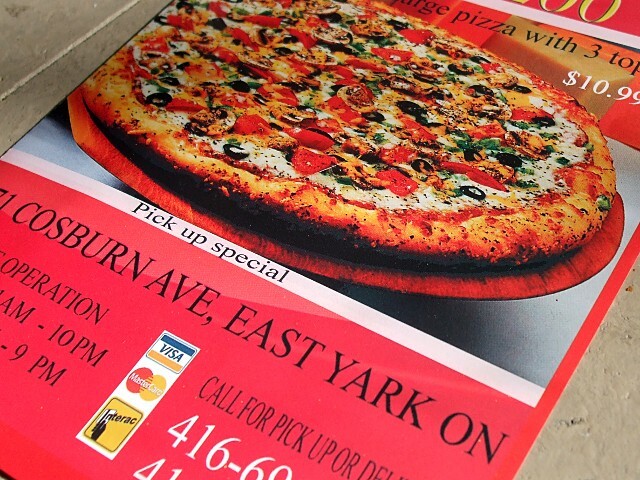 I can’t help but channel my best Fargo accent whenever I read the location on this pizzeria’s flyer. As funny a mistake as that is (and as much fun as it is to say “East Yark” over and over and over again), the sad part is that an earnest businessperson is probably losing a significant chunk of potential business from people who think that if you can’t take the time to spell-check the name of your neighbourhood, you can’t be putting much care or attention into cooking pizzas either. My mother mused for a while about starting a side business doing nothing but quick proofreading of flyers and brochures for local businesses before they get printed and distributed with howlers of mistakes on them. For a few bucks, she’d make any necessary corrections before releasing the work to the printer. She got started by correcting flyers that she received and sending them back to the offending business along with a business card and a brochure of her own. She eventually gave up after getting no responses and continuing to receive misspelled flyers months after she sent in her free corrections. But there must be a viable business in here somewhere, even if only for a printer who looks at the client’s copy and says, “Hey, wait a sec…” instead of just shrugging and starting the press. 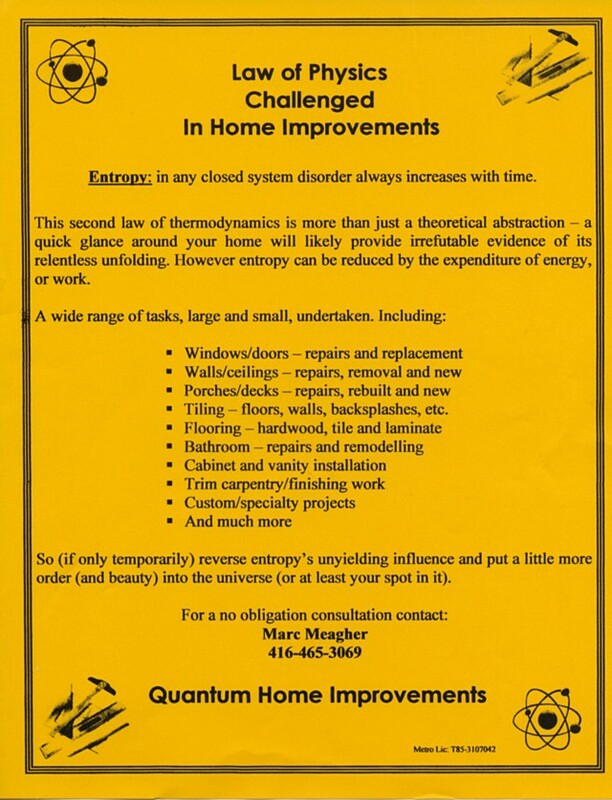 Any contractor who invokes thermodynamics in his advertising—indeed, makes it central to his sales pitch— deserves at least some consideration the next time we’re having work done. 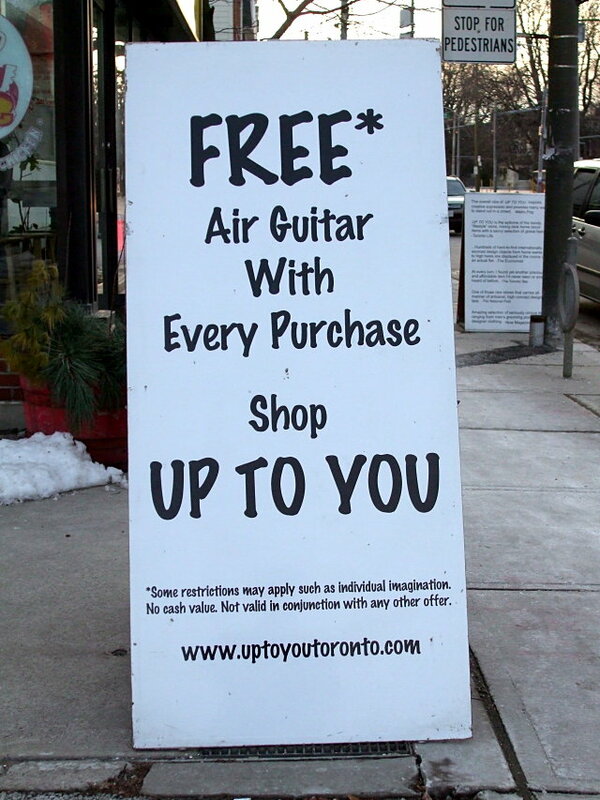 Lots of businesses can boast clever puns in their names, but few can lay claim to one in their name and a second completely different pun in their slogan. 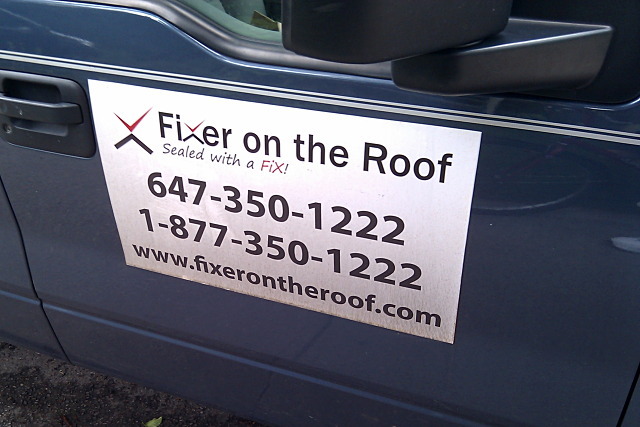 Hello, Fixer on the Roof. The eternal question about businesses bearing cutesy names is whether you really want to trust your house, car, or life to the person who thinks up these groaners. But that hasn’t stopped me from vowing to call up Bin There Dump That if I ever need a dumpster, nor did it stop me from calling in the SWAT team (Specialized Wildlife Apprehension Technicians, whose website features the cutest damn illustration of a raccoon in jail that you’ve ever seen) to evict a family of squirrels from the spare bedroom last year, nor did it make my fireplace service choice between Friendly Fires and Burning Sensations any easier. But trusting my roof to a mad punner? I’m not sure if I’m ready for that. 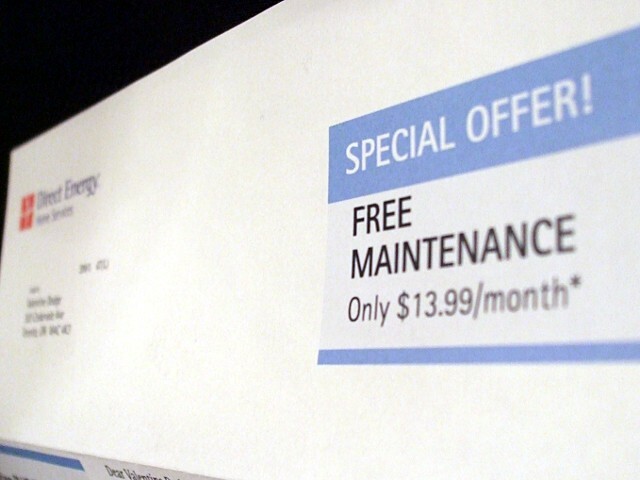 I’m used to receiving “free” offers in the mail, but rarely is a company—especially one as large as Direct Energy—as upfront about just how much free is going to cost me. I’m not even sure why they bothered putting the asterisk there; it seems pretty clear even from the large print that I’d have to be pretty daft to take advantage of this offer. Bonus: I have no idea what Bucknuts are or how they allow Direct Energy to offer “competitive energy solutions.” They really don’t sound like something I’d want to burn for heat in the winter. 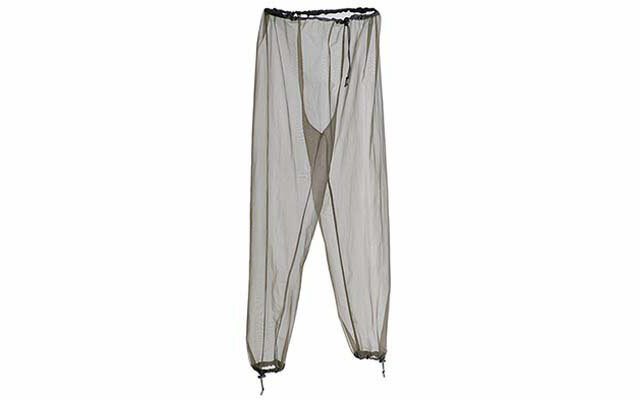 These breathable and lightweight bug pants are made of economical, airy, and bug-proof 100% polyester no-see-um mesh, and provide a very effective deterrent against bugs. Now I’m no expert, but no-see-um mesh or not, I’m pretty sure that I can-see-um right through those airy pants. Fortunately, the official product picture on the manufacturer’s web site is a little more explicit about proper wardrobe etiquette when wearing mesh pants. Picture (sans model) from MEC’s product page. Love ’em or loathe ’em, you’ve got to admit that small cars like the Beetle and the Smart lend themselves to some pretty nifty customizations. I saw this one in midtown three weeks ago and wasn’t the only one taking pictures. 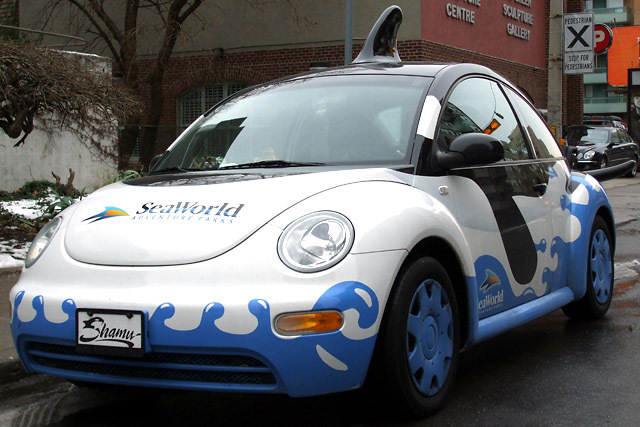 Although it has a Florida licence plate, one commenter on Torontoist says that this car lives not too far from Bayview & Eglinton. That puts it only a few blocks away from the Drywall Doctor‘s office. 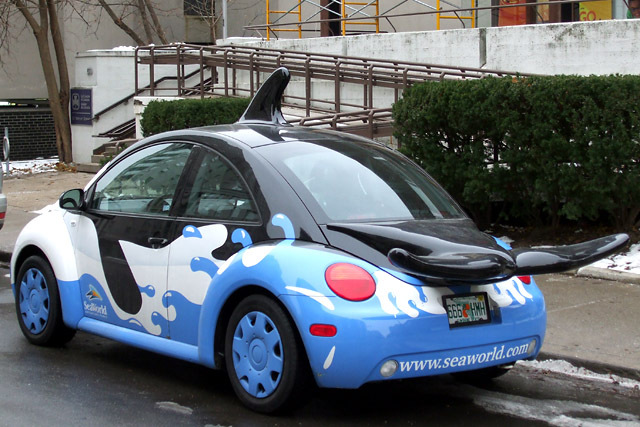 The neighbourhood would seem to have a very high density of unusual cars. I’m going to have to explore more extensively some day. My recent encounter with lolbananas reminded me of a brief craze a few years ago for third-party advertising on fruit. 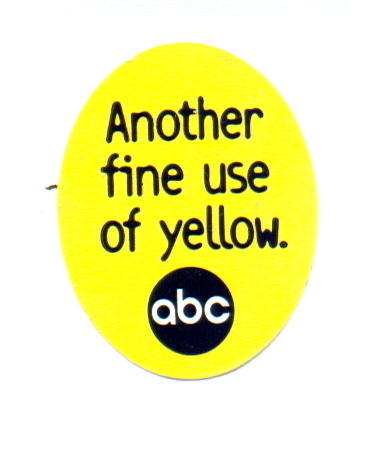 In the late summer and autumn of 1998, ABC ran ads on bananas (including ones destined for Canada), while Global covered the local apple market. CBS ran ads on eggs a couple of years ago but third-party advertising on food still seems pretty limited, especially considering how ubiquitous it is elsewhere in daily life. 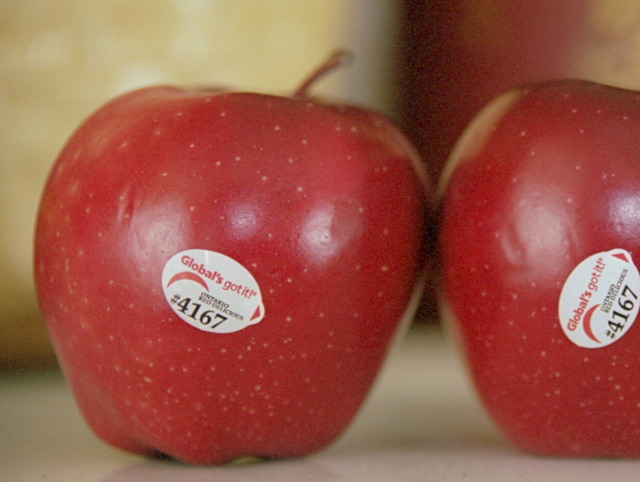 Amusingly, “Global’s got it” has been immortalized as a brand of fruit on the web site of a German fruit sticker collector. Incidentally, I regard the pictures in this post as perfect justification for being a packrat, both digital and analog. Somehow, I knew that I’d have some use for these dumb labels in the future. The scan of the banana label has migrated along with the rest of my data through ten years, having originated two scanners, four computers, and at least eight hard drives ago. Similarly, the negative for the apple picture has been sitting in my archives for all that time, waiting until today for me to scan it. But I don’t keep absolutely everything: Risa should be thankful that I don’t have the actual 10-year-old apples and bananas still hanging around in my collection.